The chart for the flight shows many references to the element of water. Note the transiting moon in Gemini in the 6th house, disposited by Mercury in Aquarius in the 3rd house. Mercury forms a t-square with Saturn opposing Sedna, the ocean goddess. Although preplanning may have been carefully devised, control over the situation was likely a major problem. Take a look at the solar eclipse of April 29 in reference to the flight’s chart. Why do I use this chart? Because eclipses are influential over a duration of time; they can hold effectiveness prior to and after they actually occur. A solar eclipse is often a harbinger for death or for births of significant note. Among its many correlations, Taurus is an archetype that references survival matters, and is often a death signature. Note the eclipse takes place in the 6th house of the flight chart. Among its many correlations, this is the house of crisis, where things can go wrong, where errors can be made. Note also the position of the solar eclipse Mars. It is in a tight opposition to Uranus. Mars is important as it is the ruler of the south node. Note also that solar eclipse Neptune is in square to the Ascendant/Descendant of the flight chart, that solar eclipse Chiron is one degree away from the flight chart sun in Pisces. 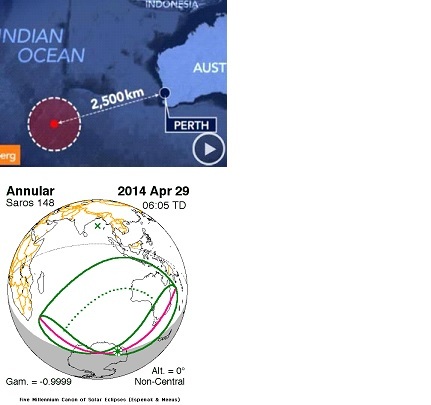 At a ready glance, note that a part of the eclipse path occurs in the Indian Ocean, exactly where the flight is assumed to have crashed. The graphic above of the Solar Eclipse is from Nasa’s website. The green dotted line is within the broader path of the Moon’s penumbral shadow. The main eclipse event occurs in Antarctica. When eclipses occur near either pole, they are said to have global or collective influence.